Yunggulba is an extension of the Megan Cope’s After the Flood series which explores geomorphology, raising questions about climate change and vulnerability of residents along the coastline of Australia. Cope combines military topographical maps (circa 1930-45) with basic cartographic symbology to reveal a multilayered landscape, dual histories, dual identities and the cultural legacy of colonialism. Aboriginal people at the time these maps were made were largely invisible in the social landscape and heavily affected by current government policies. 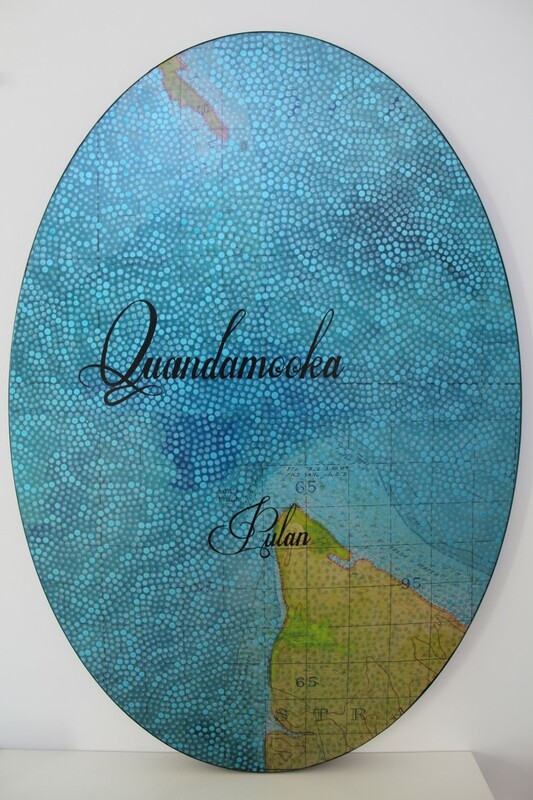 Image: Megan Cope, Quandamooka (detail) 2013, military maps, Indian ink and synthetic polymer paint on canvas. Courtesy of the artist and SGAR.